This logo is inspired by God. We took one entire summer to meditate in prayer as we sought to put together every piece of this logo and its meaning. As you read "Our Statement" below, you will find the meaning of each symbol represented on this beautiful shield. We do not require a signed statement of faith from any of our families. We believe that God called us as we are and that everyone should be made to feel welcomed. How else are we to be disciples of ALL men, women, and children? May we always love each other with the love of Christ. WITH FAITH, WE WILL POINT THE WAY TO THE CROSS, WHERE JESUS CHRIST DIED FOR OUR SINS. 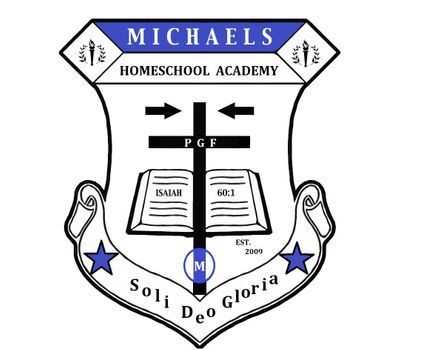 AS WE PUT GOD FIRST IN OUR LIVES, WE BELIEVE THAT CHILDREN WILL SHINE AND THRIVE HERE AT THE MICHAELS HOMESCHOOL ACADEMY. WHEREVER WE GO, WE CHOOSE TO REPRESENT CHRIST AND OBEY HIS WORD WITH AN EVERLASTING FLAME IN OUR HEARTS AND TRY TO LIVE OUR LIVES ONLY FOR THE GLORY OF GOD. = represents "Shield of Faith"
= stands for "Pointing the Way"
PGF = means "Put God First"
= represents "Children Will Shine"
M = stands for "Michaels"
= stands for "Everlasting Flame"
SOLI DEO GLORIA = means "Only For the Glory of God"